For off-road confidence and clever utility features, the 2017 Nissan Frontier is your guy. This mid-size pickup is also your go-to source for practicality, giving you the features you need to get towing and hauling jobs done in a jiffy. Rugged hardware, like four-wheel drive and specially tuned shocks, helps you take on unpaved trails in style while the cabin can be customized to your level of luxury. Under the hood, the 2017 Nissan Frontier gets everything right, striking that coveted balance of power, performance, and fuel economy. 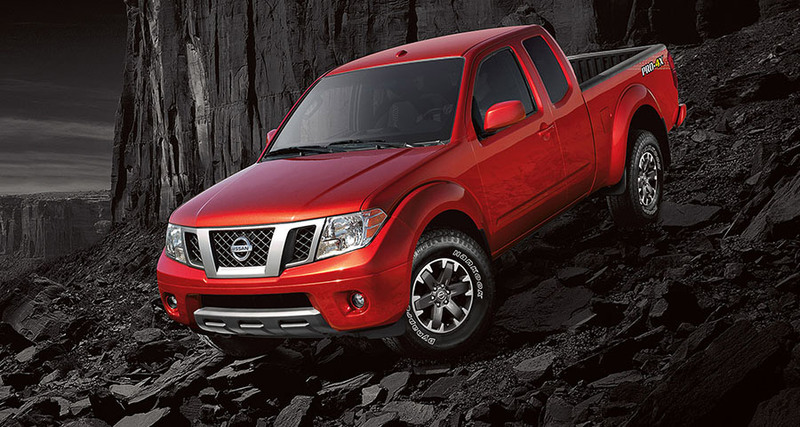 Depending on which powertrain you prefer, the Frontier earns up to 19 city/23 highway mpg. 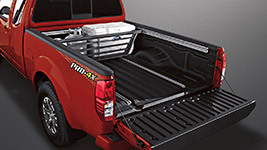 With handy gear like tie-down points and sturdy bed lining, organizing heavy cargo loads is a snap. Properly equipped, the 2017 Frontier can tow up to 6,500 pounds, which makes it a prime candidate for your next Jet Ski or boating excursion. 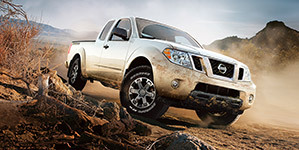 If you're into off-roading, you'll be pleased to know that the Frontier handles rugged territory with real skill. That's especially true when you add four-wheel drive, which boosts traction over soft surfaces, moving you through sand, snow, and rocky surfaces without a hitch. The Frontier's off-road-ready Pro-4X model is an excellent option for drivers hungry for true outdoor adventure. The Pro-4X gives other mid-size off-roaders a real run for their money, with rugged protective gear like skid plates and specially tuned shocks to deal with especially rocky situations. The locking rear differential supplies maximum precision when you're moving through boulder-heavy terrain. You're in good hands with the 2017 Nissan Frontier. In crash tests, the Insurance Institute for Highway Safety gave the Frontier its top score of "Good." With the rearview camera, it's easy to spot any problematic obstacles before you accidentally back over them. Add NissanConnect emergency communications into the mix and you have quick access to help when you need it most, thanks to features like the emergency call button and automatic collision notification. The 2017 Nissan Frontier cabin gets top marks for its NissanConnect touchscreen interface. In addition to letting you stream your favorite podcasts from devices, Bluetooth connectivity gives you the power to make hands-free calls. You can even send and receive texts without looking away from the road, so you can stay safe and still feel connected. Seats are supportive, making long commutes breeze by. If you have a hankering for the finer things, the Frontier offers both leather upholstery and seat heaters that supply next-level comfort. If you want to pair rugged performance with a plush ride, check out the 2017 Nissan Frontier SL. It comes fully loaded with modern creature comforts - such as premium leather upholstery and power-adjustable front seats - which are exactly what you need after a long day on the job. The Frontier SL also treats you to exclusive features 18-inch alloy wheels, which give it a little extra exterior style. The SL's handy side steps make getting in and out of the cabin a simple task. Organize your tools and work gear for quick access. The Frontier is the ultimate off-road explorer, with a four-wheel drive package that helps you navigate with confidence. When you've got major work to do, the Frontier keeps your supplies in place. Get ready for long-term support and miles of elbow room. The 2017 Nissan Frontier is a one-stop shop for your towing, hauling, and off-road needs. This sturdy mid-size truck is ready for action - especially when you add four-wheel drive to enhance traction through mud, sand, and snow-and is as comfortable and as luxurious as you want it to be.